The Worst Motorcycles I’ve ever owned. 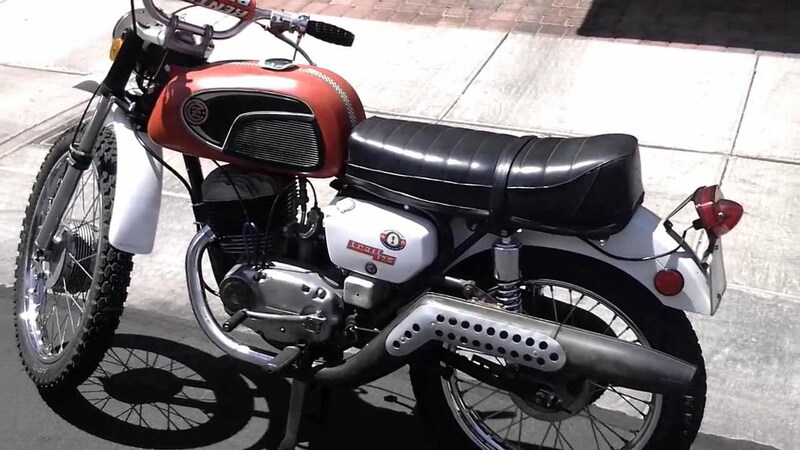 Nothing more than a re-hashed street bike with an up-pipe, the Jawa 175 Trail was purchased from an ad in the Recycler for the princely sum of one hundred and fifty dollars, running. One things though, it had a bent shift fork, and popped out of third gear, in the ancient four speed box, originally designed for a 50cc moped. When I got the bike home, and laid it over on the clutch side to start tearing it apart, I consulted the Clymer manual that detailed splitting the cases. The biked sported a giant shifter lever, that doubled as the kickstarter, and I followed the Clymer manual to the letter, taking apart the Jawa, and wondering why anyone at the Jawa factory would polish the inside of the cases!? When I took the combo shift lever/lickstart shaft out, I heard a loud un-winding of a massive spring, somewhere inside the side case. Peering into the case to see what was going on, a giant spring powered gear shot out of the cases, and hit me right between the eyes, leaving a large bump. On the next page of the Clymer manual, in red was a note: “WARNING! The kick starter gear is under high spring tension, use care when trying to remove it.” Gee, thanks Floyd. I reeled back, stunned, knocked over my toolbox, and ripped my “On Any Sunday” t-shirt on a nail sticking out of the garage wall. Cursing like a mad man, I stumbled into the driveway, dazed. That was the first and last time a bike had tried to kill me, while working on it. With great determination I went back in and split the cases, and fixed the bent shift fork. It still shifted like crap, so I sold it to an Armenian guy for two hundred dollars, along with the Clymer repair manual. Good riddance. Yamaha’s diabolical attempt at creating a street scrambler looked spiffy, but was weighed down by 100 lbs. of up-pipes, that put the center-of-gravity up somewhere around your chest. It was fast, but had the unfortunate design flaw of using a combo generator-starter hanging off the end of the crankshaft, that weighed around fifty pounds. That, combined with wimpy crankshaft bearings, would overtax the assembly, and seize up the whole mess when putting the engine under a minor load, like strapping a six-pack to the giant chromed luggage rack. Another Recycler purchase, I fixed the crank bearings a few times, and when it seized again, I sold it to a salvage yard for fifty bucks. It’s still there by the way, missing the up-pipes. We all remember our first motorcycle. We remember when we got it, how much it cost, and what it sounded like. Even what color it was. And we also remember certain idiosyncrasies that made it “interesting” to own and ride. In my case, it was a 1973 Jawa Trail 90, my first dual-purpose motorcycle. In 1973, I was in the10th grade and a rabid Jawa-CZ freak. I wore a different CZ jersey to school each day. I had CZ stickers plastered on every textbook and folder. I sported a CZ “hot-hat.” I drew the CZ emblem on everything, even dogs (cats wouldn’t hold still). My hamsters were named Barum & Jikov. 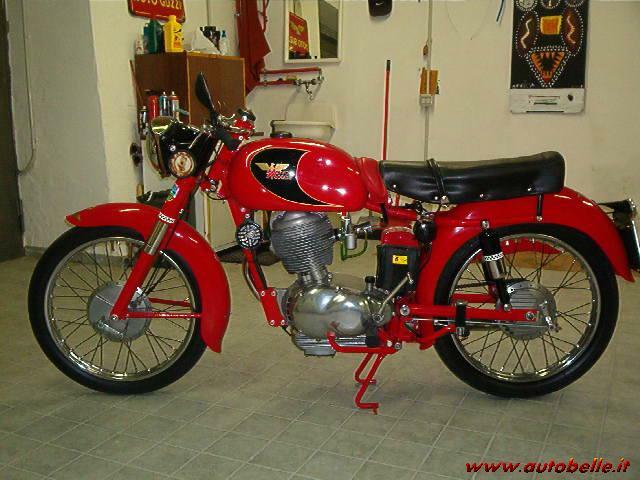 Of course, I didn’t own a CZ (or Jawa), or hadn’t even ridden one. But that didn’t stop me from eating, drinking and living CZs. Like someone afflicted with Jawa Tourette’s syndrome, I would blurt out obscure Jawa-CZ trivia to anyone who would listen. The names of factory riders, compression ratios, how many fins the new radial head had, etc. There were 2 other Jawa-CZ freaks at school and we’d gather at the same place every lunch to trade new commie tidbits. People thought we were strange. Subversive even. Around the 10th grade, my parent’s worst nightmare came true and I got my “learner’s permit” that allowed me to operate a motor vehicle during daylight hours with a licensed driver in the car. That rule didn’t apply to motorcycles though. And since my two CZ buddies (Karl and Earl) had just gotten their parents to buy them new Honda SL100’s, I started working on my parents for a new “enduro” motorcycle of my own. The ad showcased a black & white picture of a Jawa 90, with the camera angle pointed just right to highlight the radial head and trick looking banana frame. I was speechless. I didn’t even know Jawa made a 90cc racer, much less a street legal one. Joy! Was this too good to be true? I ran into the living room and showed my Grandpa. The address was in Van Nuys at someplace called Whipsnade Trading & Import Co. I called my two CZ buddies, Karl and Earl, and chided them both for purchasing an inferior Honda product. Made in Japan, indeed. I ran around the house yelling MOTOKOV! FALTA! PAL! BOBOROVSKY! I was in heaven! Some called it madness. My Grandpa was impressed. A new European motorcycle in the crate for half of what a Honda or Yamaha went for? So we got into Grandpa’s ’68 GTO and drove to the address listed. It turned out to be a big garage next to some railroad tracks in a run down section of Van Nuys. Sitting in the middle of the dimly lit garage at a card table, was Mr. Whipsnade, counting $20.00 bills out of a lockbox and chomping on a cigar. Crates of new Jawa 90’s were stacked to the ceiling. I wasn’t listening, but fantasizing about zipping along some ISDT trail in the Black Forrest, on time and on gold. We got the crate back home and carefully opened it, making sure not to scratch or otherwise damage the red and black beauty inside. After a few hours of head scratching and bloody knuckles, Gramps had the Jawa together and running, more or less. It was amazing. 170 lbs. wet and 11 horsepower produced a fast little motorcycle. But that’s when it ran. This was the motorcycle that introduced me to the greasy handshake of motorcycle maintenance. It required constant attention in order to run, and after a while I didn’t leave home without a tow-rope. I could see now why the good folks at Jawa put such a giant tool kit under the seat. You needed it, and more. Hell, looking back you needed a portable lathe and a support truck. Another horrible motorcycle from Jawa. This one got the world title as the most unreliable motorcycle ever made. About twenty years ago, my Dad and I had to get rid of an old couch, and we took it to the Bradley Dump in East LA. When we got there, leaning up against the battered Airstream trailer that doubled as the dump’s office, was a mint looking BSA 441. My Dad saw me eyeballing the Beezer, and secretly purchased it off the Dump’s proprietor for three hundred bucks. When my father came out of the trailer, he said to me: ”Load it up, it’s yours.” I was speechless. 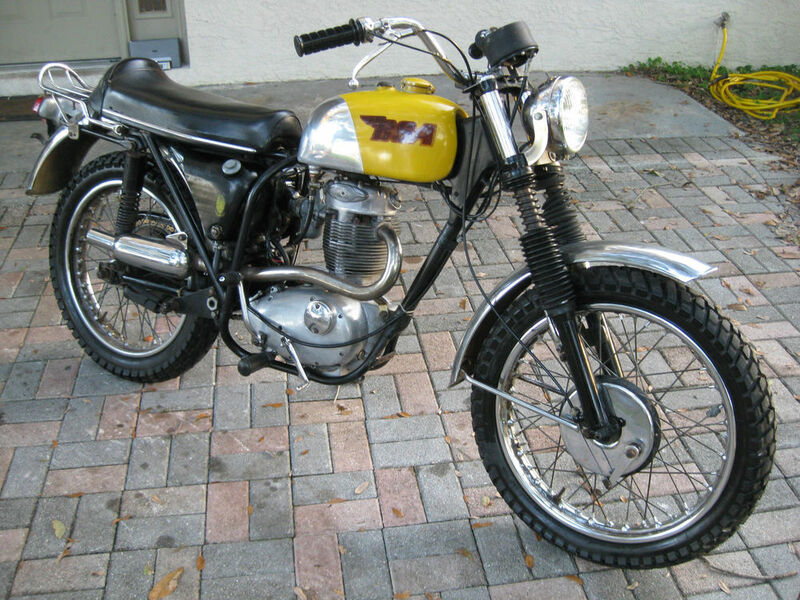 The BSA was a great looking motorcycle, with the alloy tank, sano thumper engine, alloy fenders, and no foof like turn signals or other crap, it was one serious looking dirt bike. With lights! So we loaded it up in the Datsun, and I took it back home to Burbank. After getting it out of the truck, I immediately checked the oil, poured some premium in it, and it started on the first kick! I pulled the rather stiff clutch in, and motored off down the street. 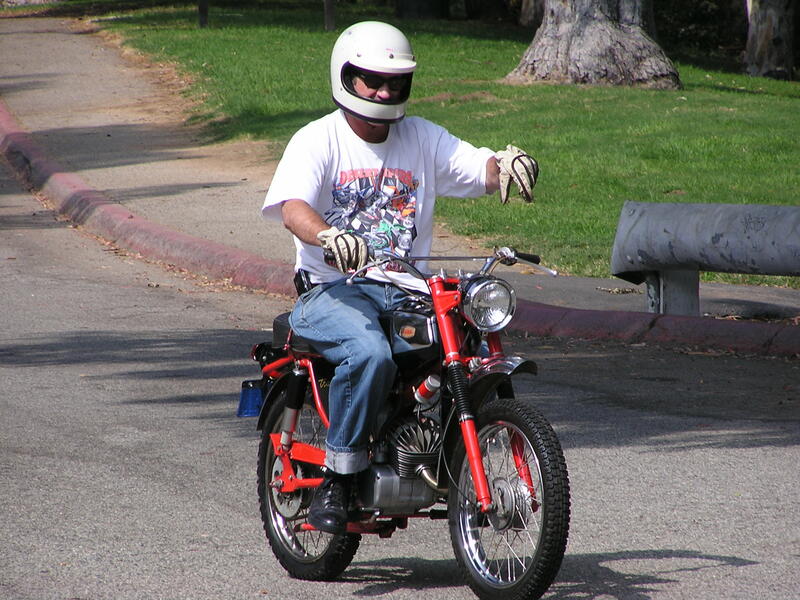 Man, this is one fast sumbitch, as I thumped down the street, the Beezer vibrating beneath me, like a REAL motorcycle. I couldn’t wait to ride it some more, so I took the license plate off my DT1, and the BSA was semi-legal for a test ride into Griffith Park, to the Observatory to show off my new bike. I quickly got my helmet and boots on, found my gloves, and started the 441 up again. Funny, took about 20 kicks that time to get things spinning, must need a new plug I thought. Right. The BSA ran fine for about five miles, but started backfiring when I let off the throttle. As I entered the backside of Griffith Park, the bike went full throttle, and scared the crap out of me. I quickly reached down and yanked the plug wire, and got a sizeable jolt from the Lucas electrics. Hmm, what the heck? I started to investigate the problem, and immediately found what had happened; The two screws that held the top of the carb on, had vibrated out, and the slide was halfway out of the carb body, causing the full throttle issue. Good thing it was all down hill, and I coasted the wounded BSA down to Riverside Drive, where I only had a two mile push to the first gas station. I asked the pump jockey if I could look for some screws in his service bay, and cross threaded two found hex bolts into the Amal Monoblock’s top. I thought to myself “have to tap those for some metric screws when I get home.” And off I went again, on my way to the Observatory. At the second red light from the gas station, I happened to look down, and saw the bolts holding the primary case on, falling out and dropping on the street. I killed the motor, and put the bolts in my jacket pocket. I had a Swiss Army knife on me, and used the flat blade screwdriver blade to put the straight slot long bolts back in the primary case holes, and tighten up the other 10 or so. They were all loose. This time I had to bump start the 441, since kicking it about fifty times had no effect, whatsoever. It was now about 4:30 in the afternoon, and I had started my “test ride” about two hours ago. A little voice in the reptile part of my brain said to me “get this pile home, quick!” But being the trusting soul I was of Anglo engineering, I pressed on, to the Observatory! I made it up the long uphill that led to the twisty backside of the park, when all of a sudden, the bike quit. Just died. No warning. Looking down again on the throttle side, I saw the carb dangling off the cable, just hanging there. The bolts that held the carb on had vibrated loose, and just vacuum was holding it on. Another long coast/push back to the 76 station, with the pump jockey now demanding a couple bucks to loan me some tools, and find some bolts out of this big bucket of greasy nuts and bolts. So I cross threaded some SAE bolts back on the studs, thankfully the gasket hadn’t got lost. It was now 5:50, and starting to get dark. I was about 10 miles from home, and decided I’d better forget the Observatory, and get back home. Sure. Had to bump-start it again, and going down Victory Boulevard, I had to turn on the lights. They worked fine, much to my amazement, but soon went supernova on me, and burnt out like a cheap skyrocket. What’s next? A gas tank explosion? Wheels fall off? So I gassed it hard to make it back home. That’s when it happened. The bike made a giant backfire, and quit again. This time no amount of kicking or bump-starting had any effect, so the five mile push home in the dark started. Some old guy in a classic ’55 Chevy pickup went by and yelled “Lucas, price of dankness Hahahhahha…” Thanks pal, I needed that. Jerk. It only took about a month to find a new headlight that fit the shell, and a Ziener diode that fried on me, along with a new battery, and various nuts and bolts (Whitworth) that had disappeared. Al Baker senior of Classic Triumph in Van Nuys was more than happy to take my C-note, for the seemingly tiny box of parts. Man knew the value of unobtanium, I must say. The BSA was in the Recycler for only a week, when some Swedish guy bought it for five big ones. I waved as he rode it away, sans a license plate. At the first stop sign the brake light quit working, and I realized right there never ever buy an old English anything. That joke about why the English drink warm beer is true. Lucas refrigerators. We shook hands, and I went back to playing caroms at the park. The next day I walked down to the park (Jawa was busted again) and found the guy in old clothes cleaning up the bike in front of his garage. It looked pretty cool, the little four stroke engine with cylinder fins that were copied on the head, so it looked like a two stroke, Shiny exposed copper oil lines went from the giant finned aluminum sump to the top end, and the orange and kind of green colors didn’t look that bad when the bike was washed. He had the battery charging off in the garage, and we shook hands and I started off “So, does your son still want the bike?” Tom was the guy’s name, and he said his son didn’t want the bike anymore since he lives in Washington. He also said his son wanted $300.00 bucks for the bike, but that was negotiable. So we put the battery back in the bike, Tom put some gas in it from his lawnmower can, and we tried to start it. After about ten minutes of kicking the bike, I asked Tom to give it a try with a push start, and it fired up after about 30 feet. The bike smoked a little, then cleaned out. It made some strange clicking/tapping noises out of the head, but I figured it had some exotic valve assembly that was probably very trick. I asked Tom if I could ride it around the block, to give it a test ride, and he agreed. We had to push start it again, and the little 175 went down the street nicely, the brakes worked, it seemed to shift ok, and the lights worked. I handled pretty good on the street, so I decided to gas it. It coughed a little and took off real good, like a strong 175 should. I got down to Monon Street, and had to stop for a car backing out into the street. When I let the clutch out again, the bike died, so I gave it a few kicks. I had to push start it again, and thought to myself it probably needed a tune up or something. Tom made it one twenty five, and I said OK. I had made some money cleaning up yards that summer, so I had $150.00 on me. I gave him the cash, and he signed the bike over to me. We talked for a little bit, and he helped me bump start the Moto Moroni again, and off I went, about five blocks from home. I leaned my new bike up against the garage wall, next to the busted Jawa, and went inside for dinner. When I came out after helping with the dishes, there was a giant pool of oil underneath the Moto Moroni. Not good. Seemed an oil like had come loose, and the banjo bolt was missing. Oh well, how bad can that be, just get a new one, right? So the next day, I went to World Cycles on Sunset, and asked May, the parts Lady, where I could get a banjo bolt for a Moto Moroni 175 Trail, the one in the case. She said the only place she knew of was a joint called Cosmopolitan Motors in Pennsylvania, and gave me one of her cards, and wrote the number down on it. It was too late to call, so I waited for the next day to call this place in Pennsylvania. Little did I know the mess that I was about to step into. That next morning I called Cosmopolitan Motors and immediately got put on hold for about half an hour. Finally some lady answered, and I gave her my problem. She looked up the part on the microfish, and said it would be five dollars and seventy five cents, less postage. I said great, and I’d send a money order out to her as soon as I could. She said fine, and we hung up. I didn’t ask her how long it would take to get the part, but I was sure it would be a week at most.